There's a question that we get asked a lot when it comes to Squarespace websites... It goes a little something like this. So when Sophie of Sophie Zen approached us to build her signature e-course 'Sacred Social' using the Squarespace platform, it was a challenge we just had to accept. The goal here was to create a flexible website that allowed Sophie to create and update the content as she pleased (one of the many reasons we LOVE Squarespace in the first place), that also hosted the sales page - which needed to be striking to capture her audience and that provided a secure membership platform for her e-course participants to access all of her Sacred Social goodness. Before we jump too far down the rabbit hole, we wanted to share with you what Sacred social was all about and the vision Sophie had for her new flagship program. Sophie Wood is a social media mentor who works with coaches and creatives to transform their social media. She does this through social media coaching, social media management and her signature online program Sacred Social. Sacred Social is a program that teaches coaches and creatives how to use social media in a way that is deeply rooted with intention, creativity and flow. What was the evolution of creating Sacred Social? I'd been working 1:1 with clients when I started to realise that social media was so much more than going through the actions of posting an image with a caption. I realised that so much of what was holding my clients back on social media wasn't the skill or knowledge but their mindset. Around the same time, I came up with the term 'sacred social media' which I felt described the way that I wanted to show up on social media. I started to explore the core part of sacred social media and came up with seven core pillars which I turned into a smaller digital product. From there, I couldn't stop researching and creating content around this idea. I work with the most soulful and spiritual women and I realised that information like this could transform the way that they show up on social media. From my perspective, nobody was teaching how to use social media in a way that aligned with my client so I decided to create an e-Course. So I came up with the idea in February and launched the e-Course in September. How did you go about creating the e-course content for the Sacred Social? 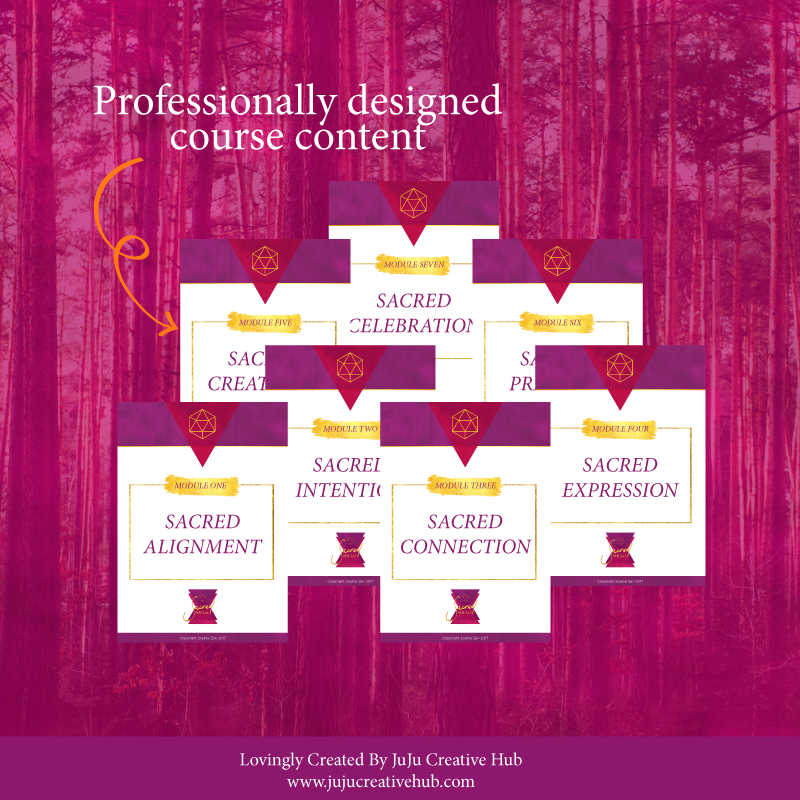 While I had some of the content and concepts already created and mapped out in blog posts and resources for clients, creating content for Sacred Social really took me back to square one. I gathered everything I knew, read lots of books, dived into research and put it all together in the core pillars of sacred social media - which then became my modules. What things did you consider before working with a designer? I knew that I wanted Sacred Social to feel luxurious and beautiful so I knew that I would definitely want to collaborate with Elle to help me bring it to life. Did you invest in any other products/services to help bring Sacred Social to life? I have a gorgeous wing woman who helped support me with week to week tasks like editing audio and video, writing and proof-reading copy and supporting me with social media and emails. I also worked with a photographer for new images. What would you say to someone who's considering branding for their e-course? Find someone who you know truly cares about your project and is invested in bringing it to life. 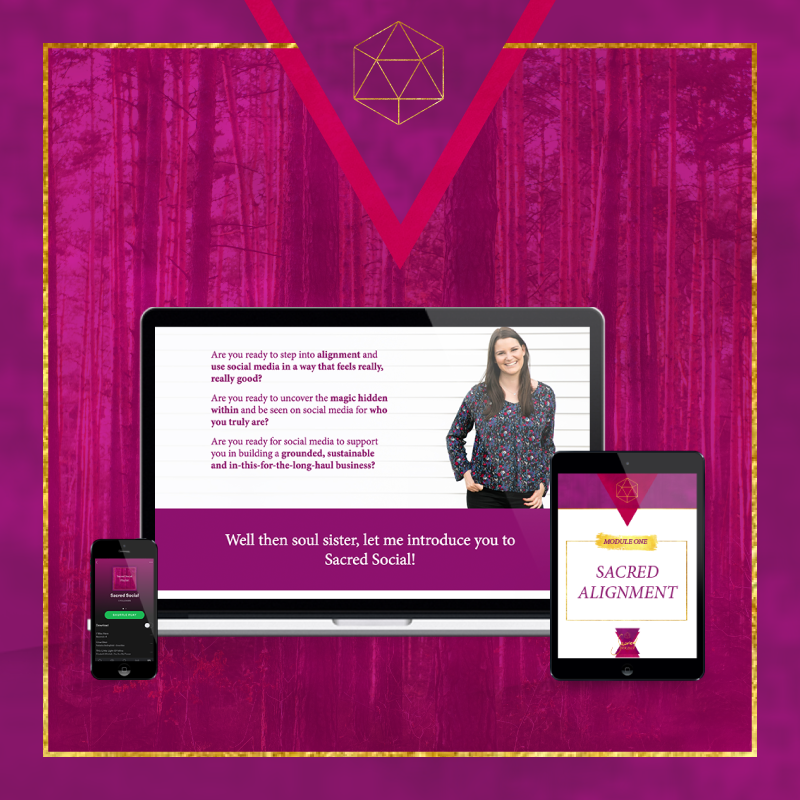 The branding for Sacred Social took it's roots from a couple of digital products we'd already helped Sophie Zen bring to life. 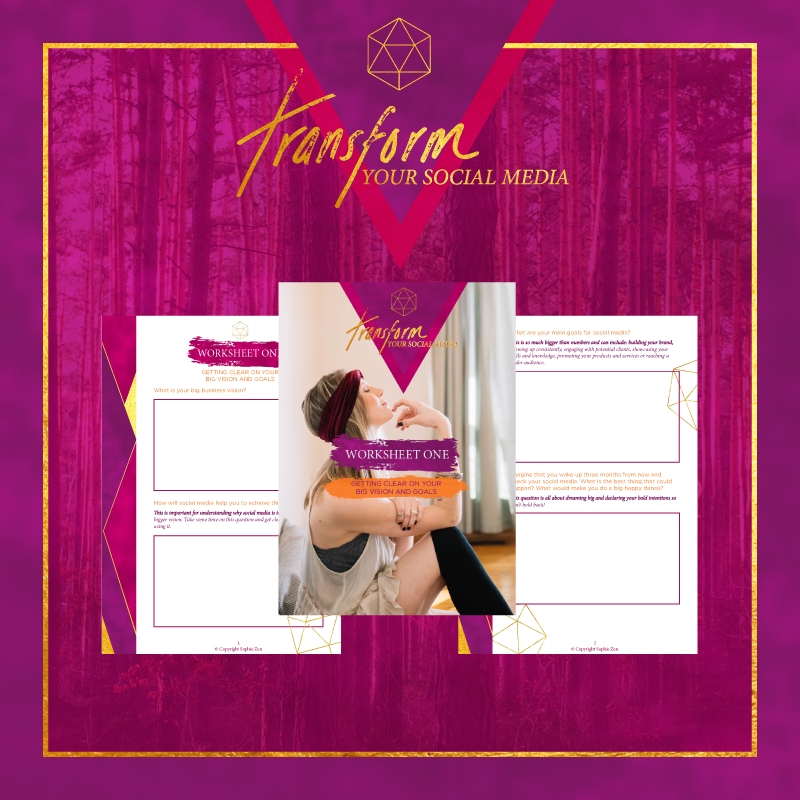 These being her powerful 7-day email series 'Transform Your Social Media' and her signature 'Spirited Social Media Circle' offering. Before diving into the deep end with any sales page, it's important to have a very clear vision! As Sophie already had a brand developed for Sacred Social, it was a breeze to extend this one step further into the sales page. The purpose of any sales page is to showcase just how much value and knowledge you have to offer in the hope that your dream clients say a big 'Hell YES!' at the end of it, or better yet, skip straight to the BUY NOW button! "Spiritual, Magnetic, Transformational, Feminine and Magical"
Thanks to the work Sophie had done as part of the E-course Launch Formula, she already had a clear brief and direction for both her sales page and course in general. We really couldn't stress the importance enough of doing the work before you begin to invest in the technology or design setup. 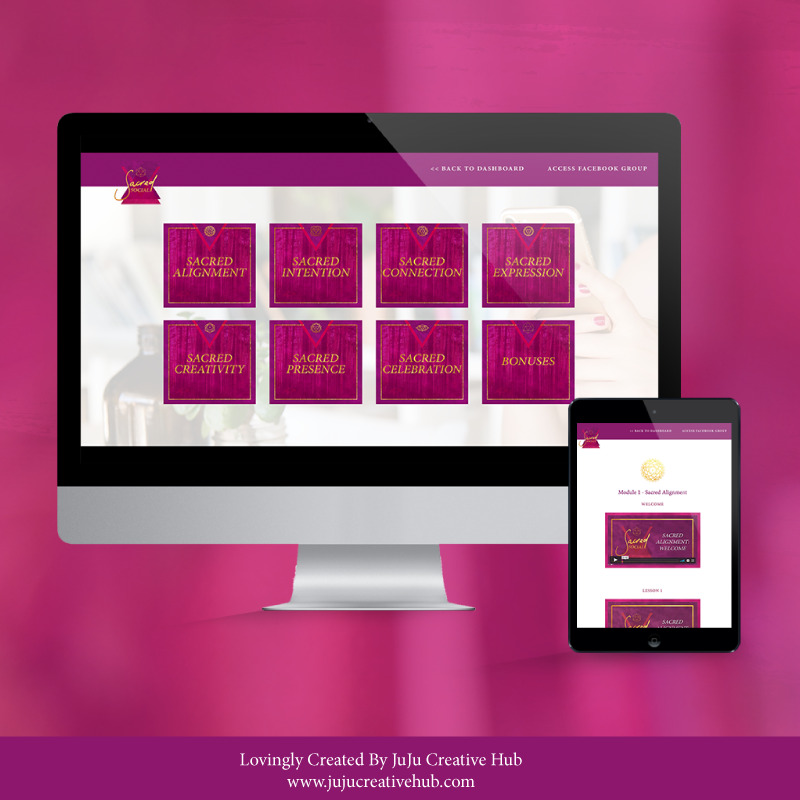 Create a clear brand vision for your sales page and e-course. If it's different to your existing branding, you might like to invest in a branding project first, to make sure it really meets your target audience. Create your sales page outline before your design begins. Whilst there's some specifics that can be added in and adjusted later, having your copy already written (preferably by a professional copywriter) will make the process a lot more streamlined. Let's be honest, if you've read this far in the post you might be thinking to yourself 'This sounds like so much work and I haven't even got to the content creating part yet!'. Or perhaps you've already created your course, but you're just waiting to put the finishing touches on it. Everyone creates their course differently, includes different content, activities and resources. When it came to Sacred Social, Sophie wasn't 100% sure what it would look like yet, and knew for a fact that it was a program that was going to grow and expand. So it was important to keep the resources we developed flexible for Sophie to be able to update them in the future if need be. Now of course, this approach isn't for everyone, but if you're looking to adapt and change the content yourself - be sure to communicate that to your designer in the first instance, as it will help them cater the development of your course content with that in mind. Alternatively, if you'd prefer they handle all the future updates then I'm sure they'd love to continue working with you in that way! Even if you're creating the course content as the course is running, be sure to discuss your requirements with your designer, so you can make sure anything they create will give you flexibility and meet your needs. No e-course project of ours is complete without some beautifully designed marketing materials - and neither should yours! You've poured your heart and soul into creating your product and now it's time to share your e-course with the world. Putting your best foot-forward, and attracting those dreamy students can be helped by some beautifully designed marketing materials. Think about the places your dream clients are hanging out and ask yourself what the key messages you need them to know about your e-course are. This is a great starting point for your marketing plan! 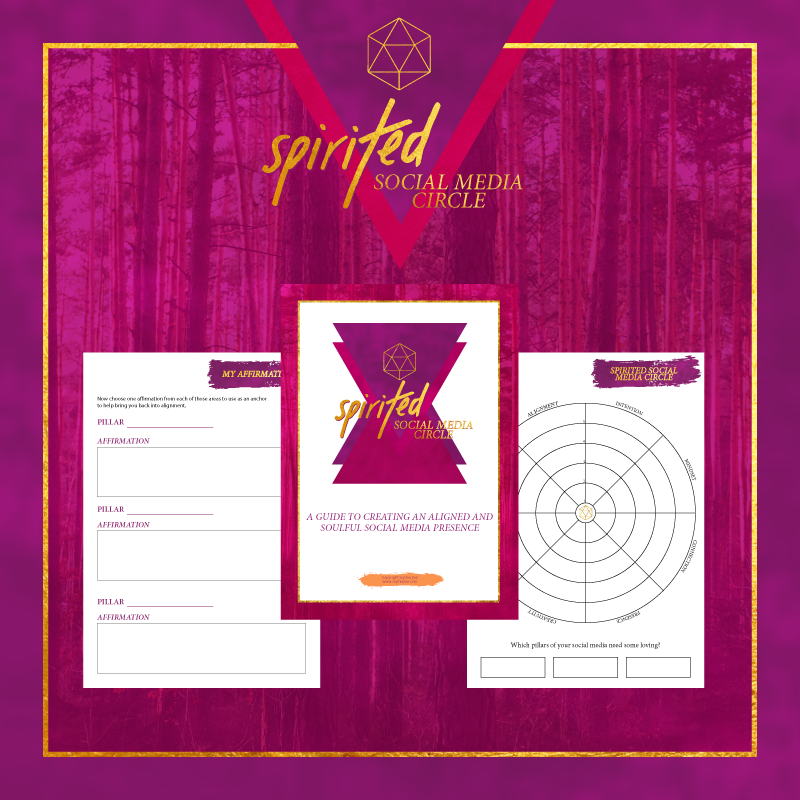 For Sacred Social, we created some Instagram templates that allowed Sophie to create her own graphics as needed throughout her promotional period along with some more formal 'launch' graphics, including a launch grid image and Facebook cover image promoting Enrolments opening for Sacred Social! There are hundreds of ways you can create an e-course these days. There's platforms like Teachable, or you can simply deliver your content through ConvertKit or Mailchimp. For Sacred Social Sophie wanted her students to feel clear, supported, inquisitive and luxurious when they entered her site - so this meant creating a custom-branded membership hub, with individual access. As we mentioned at the start of this post, our choice for the Sacred Social membership platform was Squarespace. WHY? Because we truly believe it's one of the easiest platforms for our clients to manage and update themselves. As this was the first round of Sacred Social, it was important that the platform was flexible enough for Sophie to update it herself in the future. Through some custom coding and a sprinkle of custom designed graphics, the platform is designed to grow with the needs of the course. As we tell each and everyone of our clients, we're yet to find something that is absolutely NOT possible with Squarespace. So if you're thinking about setting up an e-course through Squarespace, here's a little insight into the technology you're going to have to consider. Because you actually want people to pay you don't you??? Something like Stripe, Paypal or even integrating with a third-party app such as MoonClerk will do the trick! This is the little genius that will keep your new enrolees informed, deliver that all important course content as well as any announcements throughout the course. Our preference is ConvertKit, which is exactly what we used for Sacred Social. Our favourite is Sentry Login. Why? Well we've seen how others work, and they're less than secure (read: they only 'hide' your content, so if someone has the URL they can still access it). Sentry Login allows you to create individual usernames and passwords, along with multiple membership types, so you can potentially have multiple levels of membership! Ready to launch your very own signature e-course? Head on over to our e-course projects page, and get-in-touch about your project!